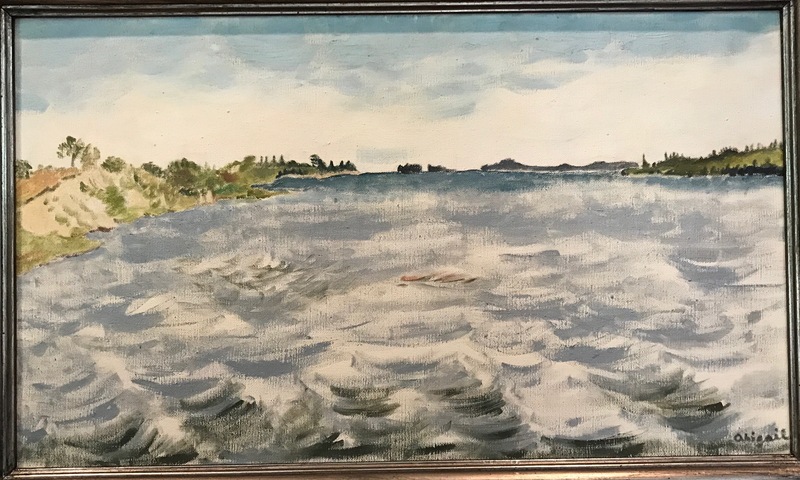 Homage to Milbridge | "Dear Abbie: The Non-Advice Column"
Last week, Jerry and I spent two whole days in Milbridge, Maine, bookended by travel days of which (the return trip) the less said the better. About the state of Maine, I smile when, looking down, I can see Maine from the plane as it descends to the Bangor airport. Milbridge has a special resonance with my whole soul and body. Why do I feel that way? It’s a real feeling, not an imagined one. Let me go over its layers, the mille feuilles of the feeling. This indeed came to pass, as did many of my mother’s visions of life-in-the-long-term. It was not precognition, I think. It was her loving, intuitive sense of the directionality of a life. In the years when my parents were alive, I would come to recognize the house as a summer place of refuge and renewal for me. When the complete cast of characters that made up our world in Milbridge was alive and well, it was a landscape of gaiety and country adventures: outdoor games, picnics, trips to the State Fair and Maine rodeos (in which friends competed), cantering through the grassy fields, sailing, canoeing and shared town events. The triumphs of life and the fun. “There’s lots more fish in the sea,” possibly thinking that it was time I looked over some of the local mariners. It was in Milbridge that the long-distance call came from New York that my seven-year job fight had been won. I went promptly to tell old friends Frank and Ada Graham and do some cartwheels on their lawn. Don’t do it in Milbridge. After my job was secure, I could turn to getting my father’s posthumous philosophic manuscript published. Once the book had appeared to favorable reviews, I felt that the house was no longer the sole visible evidence of my parents’ presence in the world. Since the house and its obligations also tied me to my ill-wisher, I felt the time had finally come to sell the house. As I began to gather the needed proofs of ownership, some unforeseen problems surfaced. My parents had been pretty smart people but, when it came to buying a rural property, they were babes in the woods. My father had bought the shore strip for $500 from a neighbor — who didn’t own it! There was also a right-of-way that we didn’t own. So the rectangular half-acre of land continuing on the other side of the road and abutting the Bay that they thought they owned was actually a triangle that stopped short of the road on the near side. A property of that size and shape is unsaleable. I learned that the right-of-way was owned by a man of about 99 years of age who had myriad descendants. If I couldn’t get him to sign off on the sale, I’d be spending the rest of my days tracking down his heirs. But who knew how to find him? The shore strip turned out to be the property of a couple who lived in Massachusetts. They too would not be easy to find, much less do business with. Enter Shirley Kennedy, a local friend and champion barrel racer. Shirley knew the who, the when, and the whereabouts of everybody in the locality. Leading the way on horseback, she tracked them all down: the aging shore strip couple from Massachusetts and the old man with the right-of-way. If you can picture the scene, it sure didn’t hurt that we were on horseback when we found them. These days, our house has become unrecognizable to me. It was purchased by two southern ladies who’ve filled it out with stepped gardens, patriotic bunting draped over the porch, and the porch itself reconfigured to appear more mansion-like and imposing than it ever looked in our day. I stop by the house when we’re in town, to peer at it, trying to see if I can recognize one molecule of how it was when it was ours. Nope. Not even a ghost of it is ours now. It’s all theirs — but I’m always relieved to see it well taken care of with its new air of splendid permanence. This entry was posted in Action, Afterlife, Art, Art of Living, beauty, Childhood, Courage, Cultural Politics, Culture, Desire, Eternity, Ethics, Evil, Faith, Femininity, Freedom, Friendship, Gender Balance, Guilt and Innocence, Heroes, hidden God, Ideality, Identity, Immorality, Immortality, Law, Legal Responsibility, Love, Memoir, memory, Moral action, Moral evaluation, Moral psychology, Mortality, nineteenth-century, Ontology, Past and Future, Peace, Philosophy, Power, presence, promissory notes, Psychology, relationships, Religion, Roles, social ranking, spiritual journey, spiritual not religious, Spirituality, status of women, The Examined Life, The Problematic of Men, The Problematic of Woman, the profane, the sacred, Theism, Theology, Time, twentieth century, twenty-first century, Work, Writing, Zeitgeist and tagged "The Consolations of Philosophy: Hobbes's Secret; Spinoza's Way" by Henry M. Rosenthal; ed. Abigail L. Rosenthal, "You Can't Go Home Again", Abigail's Adages, Alentejo Coast, babes in the woods, Bangor Airport, barrel racing, canoeing, cantering, city slickers, coming home, damaging stories, death of parents, defamation, defamation disbelieved, divorce, Downeast, Ellsworth Maine, familiar landscapes, first marriage, fishing village, fun days, half acre, homecoming, imaginary feeling, job fight, landscapes, last illness, local ghosts, local sage, Maine, Maine Coast Memorial Hospital, Milbridge Day, Milbridge Maine, more fish in the sea, Narraguagus Bay, New York apartment, orphaned, outdoor games, parental presence, philosophic manuscript, picnics, Portugal, posthumous manuscript, posthumous publication, precognition, proofs of ownership, real feeling, reviews, right-of-way, rodeo, rural adventures, rural property, sailing, saleable property, selling the house, sense of direction, shore strip, slander, southern mansion, state fair, telling the whole town, town events, travel days, trials of life, triumphs of life, unsaleable property, unseen presences, victorious fights. Bookmark the permalink.